Puget Sound salmon (genus Oncorhynchus) spawn in freshwater and feed, grow and mature in marine waters. During their transition from freshwater to saltwater, juvenile salmon occupy nearshore ecosystems in Puget Sound. This period of nearshore residence is critical to the viability, persistence and abundance of Puget Sound salmon. Thus, restoring and protecting nearshore habitats important to juvenile salmon must be a part of efforts to rebuild depleted salmon runs throughout this region. The primary objective of this report is to summarize what we know about salmon use of nearshore habitats to help protect and restore these habitats. Five species of Pacific salmon spawn and rear in Puget Sound. Use of nearshore ecosystems varies considerably between and within species. The concept that not all salmon use nearshore ecosystems in the same way is fundamental to the planning, implementation and monitoring of protection and restoration actions directed at salmon. This report focuses on naturally produced juvenile Chinook salmon and juvenile chum salmon, because these two species make the most extensive use of nearshore habitats. For each species of salmon, use of nearshore habitats varies with scale. Two important scales of variation in habitat use are population (i.e., within species) and life history strategy (i.e., within population). Populations are subspecies units that refer to geographically discrete, semi-isolated breeding units of salmon. Populations differ in their use of nearshore habitats because of the specific conditions (e.g., differences in flow regimes, temperature regimes and migration distances) each encounters. Populations are aggregated by the National Oceanic and Atmospheric Administration (NOAA) Fisheries into groups called Evolutionarily Significant Units (ESUs) that are used to make decisions about status under the Endangered Species Act (ESA). Two groups of Puget Sound salmon populations were listed as threatened under the ESA. The 22 populations of Chinook salmon spawning within Puget Sound east of the Elwha River were grouped into one ESU and listed as threatened in 1999. In addition, two populations (consisting of eight sub-populations) of chum salmon spawning in Hood Canal and the eastern Strait of Juan de Fuca during the summer and early fall (termed summer chum) were also grouped into an ESU and listed as threatened in 1999. The second scale of variability important to understanding juvenile salmon use of nearshore ecosystems is the life history strategy of the fish. Individuals within a population vary in habitat use, based upon such factors as where they come from within the watershed, spawning timing, climate and abundance. Although life history variation occurs along a continuum, individuals within a salmon population can be aggregated into a more discrete number of life history strategies. In Puget Sound, juvenile Chinook salmon have been aggregated into four general life history strategies, referred to as migrant fry, delta fry migrants, parr migrants, and yearlings, based upon when the fish leave freshwater and their size at this time. The first juvenile Chinook salmon to arrive in estuaries are fry (< 50 mm fork length [FL]), which enter natal deltas between December and April. Some of the fry pass quickly through the natal delta (the migrant fry strategy) and enter Puget Sound, spending only days in natal deltas. Other fry (the delta fry strategy) remain in natal deltas for extended periods of up to 120 days, where they make extensive use of small (1st or 2nd order), dendritic tidal channels (channels that end in the upper end of the marsh) and sloughs in tidal wetlands. During the late spring, fish associated with two other life history strategies (parr migrant and yearling) leave freshwater rearing habitats and migrate downstream to the estuary. Most parr migrants and yearlings arrive in the delta from May to mid-July. Residence time and migration timing from the natal delta into Puget Sound habitats are a function of a number of factors. In particular, with the exception of the migrant fry strategy, fish size at the time the fish arrive in the delta and residence time in the delta tend to be inversely related. Environmental conditions, especially increasing water temperatures, may also be an important determinant of when juvenile Chinook salmon leave delta habitats. Once juvenile Chinook salmon leave estuarine/delta habitats and enter Puget Sound, they distribute widely throughout nearshore ecosystems. Their abundance in shoreline areas of Puget Sound typically peaks in June and July, although some are still present in shoreline habitats through at least October. As the fish increase in size, the depth of the water and diversity of habitats they use change. Optimal conditions for smaller juvenile Chinook salmon (< 70 mm) in estuarine areas appear to be low gradient, shallow water, fine-grained substrates (silts and mud), low salinity, and low wave energy. As they grow, juvenile Chinook salmon use a greater diversity of Puget Sound habitats including deeper, more offshore habitats, and eventually, most fish leave for North Pacific Ocean feeding grounds. Within Puget Sound watersheds, we have not yet identified discrete life history strategies for chum salmon populations. 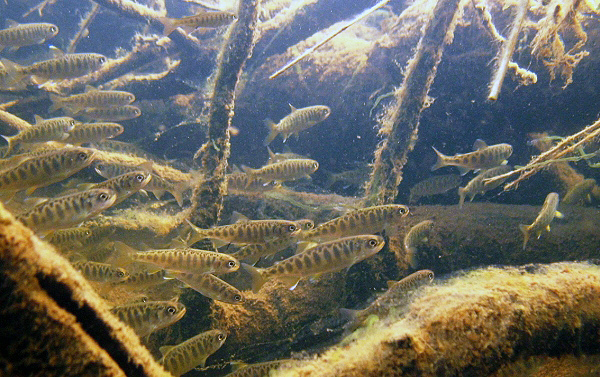 Most chum salmon fry leave freshwater within one or two days of emergence, which can occur as early as December. These early emerging fish are likely summer run chum salmon, with later emerging members belonging to other races. Most available information on chum salmon does not distinguish use based upon race (i.e., it is not specific to summer chum salmon). The timing of when chum salmon enter nearshore ecosystems should affect some aspects of habitat use such as diet, residence time, growth rates and so on, simply because the condition of nearshore ecosystems is not the same for early and late migrants. Chum salmon fry can either pass directly through natal estuaries into Puget Sound, or they can rear for weeks in estuarine habitats before moving into shoreline areas. Juvenile chum salmon often occur in non-natal estuaries. Migration rates of chum salmon in nearshore areas depend upon such factors as fish size, foraging success and environmental conditions (currents). Habitat use appears to be strongly size dependent. Small chum salmon fry (< 50-60 mm) tend to migrate along the shoreline in shallow water, < 2 meters in depth. As chum salmon fry increase in size to more than 60 mm, they expand the habitats they use to include nearshore surface waters. Chum salmon abundance in nearshore areas peaks in May and June. Abundance after June declines significantly as chum salmon move farther offshore and mi- grate out of Puget Sound, although some are still found in nearshore areas through October. 3) the physiological transition from freshwater to saltwater, and 4) migration to ocean feeding habitats. In general, our ability to quantitatively or conceptually link nearshore habi- tat characteristics to functions of that habitat for juvenile salmon (i.e., salmon performance) varies considerably with species and habitat type. This reflects the complexity of the salmon life cycle and the fact that the habitat requirements of salmon can vary broadly as a function of many factors, including specific location of the habitat, time of year, species, population, size of salmon, and life history strategy. For example, our ability to link nearshore habitat characteristics to functions that support juvenile Chinook salmon is strongest in natal deltas and weakest along shorelines. What species, life history strategy, and size class is being considered? What habitat type is being affected (e.g., eelgrass bed vs. tidal channel)? Where in Puget Sound is the action occurring? What type of action is being considered (e.g., dike breaching vs. armoring)? What constraints, such as geomorphologic context, exist? If such scenarios can be devised, then we can more directly explore how an action may affect salmon population viability, identify possible outcomes of an action, define key uncertainties, and help assess potential risks. Fresh, K. L. (2006). Juvenile Pacific Salmon in Puget Sound. Puget Sound Nearshore Partnership Report No. 2006-06. Published by Seattle District, U.S. Army Corps of Engineers, Seattle, Washington.